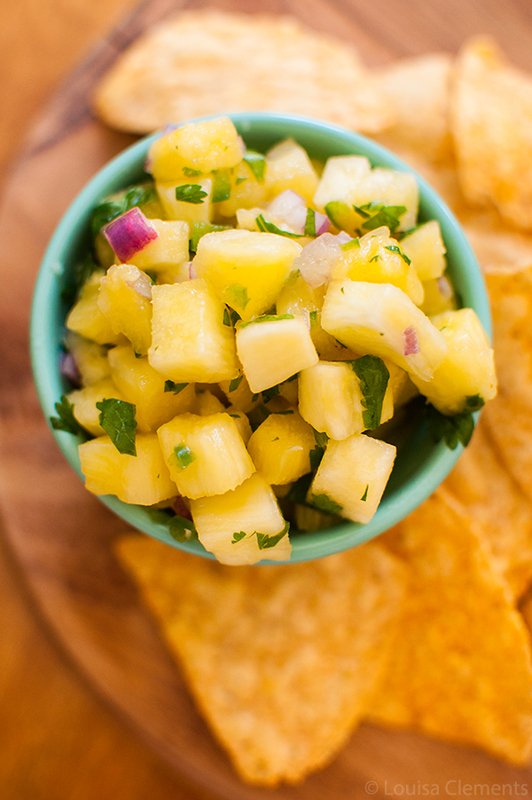 This light and refreshing pineapple salsa is perfect for summer. Packed with fresh pineapple, red onion, cilantro and jalapeño this works great as a snack or alongside grilled fish. 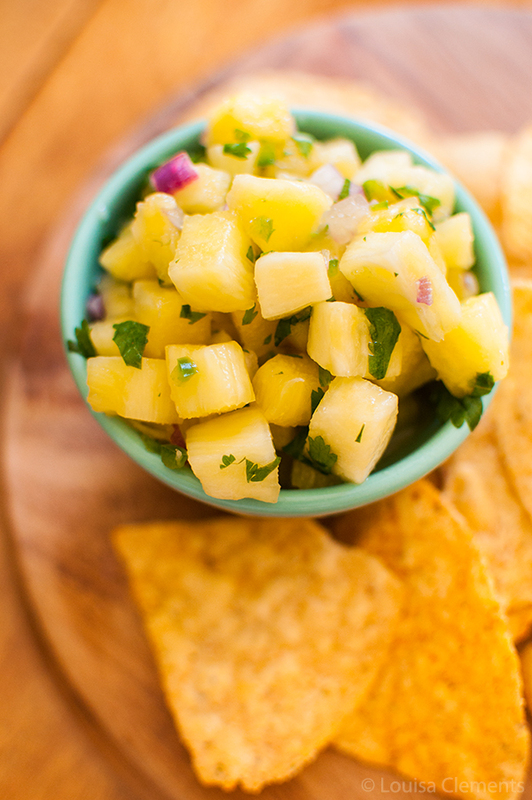 Pineapple salsa sounds like the perfect, fresh summer recipe, don’t you think? With the May long weekend coming up (which is the unofficial kickoff of summer in Canada), I have summer on my mind. Which is not a bad thing at all. I went up north last weekend for my first cottage getaway of the summer, and can I just say that I have really missed getting out of the city and into the sunshine and cleaner air. It can be a lot of work to arrange everything and actually get up there. I always make plans to head up north a few times every summer, but the time just flies by and before I know it, fall is here. I always forget how quiet it can be up north–have I mentioned before that I love silence? It’s one of those things that manages to be both mundane and magical at the same time. Anyway, with my first out-of-the-city weekend under my belt and the beautiful weather we’ve been having in Toronto, I’ve been in the summer cooking mindset. This means lots of fresh flavours, meals in the backyard, grilling and enjoying simple, flavourful recipes. Fresh food is what summer is all about, is it not? I’ve been on a huge salsa kick these days, there are just so many different variations you can try. I really believe that it is the ultimate snack/condiment/dinner. Yes, I have eaten a bowl of salsa for dinner before and no, I don’t regret it at all. It wasn’t with a spoon, there was a bag of chips there too. I took a look back through the archives when I was putting together my editorial calendar and realized that I have been holding out on you in the salsa department as I only have a basic salsa recipe on here which I posted years ago. Well that’s all about to change with this recipe for pineapple salsa – it goes really well with corn chips but I also like to serve it on top of grilled salmon – which you may have seen if you’re following me on Instagram or in my last month in moments. Now that school is done and I’ve had a few weeks to adjust to this “new normal” of working 9-5. It’s weird to think that I’m going to be doing this sort of thing for the rest of my life. Alas, I’m ready to really focus and get back on my blogging schedule. Back on the posting every Sunday and Thursday schedule – how does that sound to you? Last year I somehow managed to have this really consistent schedule going for almost the full year and it’s about time I got back into that. It can be difficult with all the crazy moments and busy-ness that comes with life, but I’m going to try my best, which is all that I can do. This light and refreshing salsa is perfect for summer. Packed with fresh pineapple, red onion, cilantro and jalapeño this works great as a snack or alongside grilled fish. In a large bowl, toss pineapple, red onion, cilantro and jalapeno with lime juice and oil. Season with salt. Serve over fish or with chips. Until next time, soak up the warm weather and enjoy my recipe for pineapple salsa.